The United Church of Christ and the Open and Affirming Coalition stand today with our transgender members, neighbors, friends and family throughout this country. This morning, President Trump imposed a total ban on service by transgender Americans in the United States Armed Forces. The action was announced less than 24 hours after the Texas Senate voted to bar transgender people from public bathrooms that conform to their gender identity. Our transgender neighbors live in a climate of fear. Transgender women of color are dying on the streets of our cities, and 30 states fail to provide any legal protection for transgender citizens from discrimination in housing, employment or public services. The President has now banned transgender Americans from military service “in any capacity,” including more than 15,000 who are currently serving their country on active or reserve duty. Discrimination in any form violates our values as followers of Jesus Christ and as Americans who believe in liberty and justice for all. Transgender citizens in uniform have proven time and again their dedication to this country. They deserve our support and respect. In 2003, General Synod affirmed “the participation and ministry of transgender people” in the United Church of Christ and pledged support for “their civil and human rights.” Acting on this resolution, the UCC’s national officers and the Open and Affirming Coalition urge congregations and other settings of our church to stand publicly with our transgender members and neighbors in this urgent time, and whenever and wherever their dignity as human beings and their basic rights as citizens are threatened. 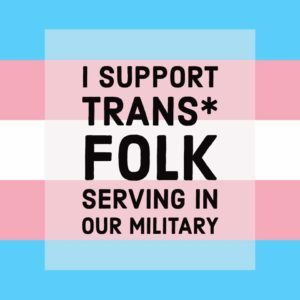 Together, we strongly affirm the work of United Church of Christ chaplains in the armed forces, who are faithfully serving our transgender neighbors in uniform. Their ministry is needed now more than ever. See the 2003 General Synod resolution affirming transgender people in the UCC and supporting their civil and human rights.